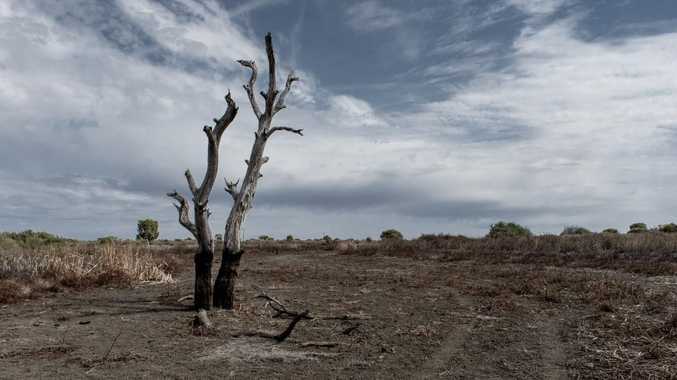 CUSTOMERS at Coles, Woolworths and Aldi are being misled by an "empty media stunt" when they pay a 30c surcharge to support drought-stricken farmers. 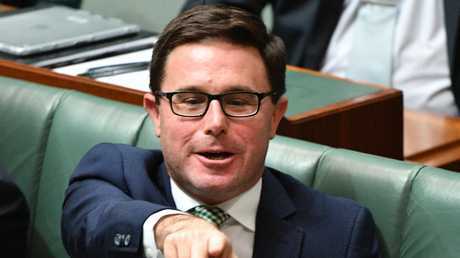 Or at least that's the claim of irate federal Agriculture Minister David Littleproud, who launched a scathing attack on all three supermarkets yesterday - calling the scheme "half-baked" and a "farce". He claimed they failed to follow through with the original idea of a 10-cent-a-litre levy on all milk brands which would be paid to processors that supply supermarkets. But he took particular aim at Coles and said the supermarket was forced to take part in the scheme when rival Woolworth's signed up. 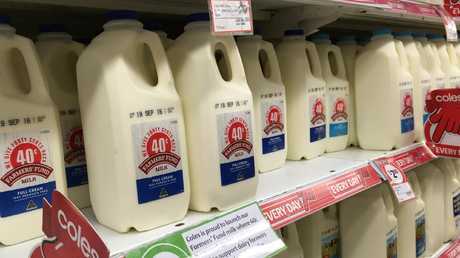 "The result is a half-baked policy which only applies to Coles' three-litre variety of their own milk brand - and may not even go back to the farmers who supply that tiny portion of drinking milk," he said. Coles has introduced a 30c surcharge on all of its three-litre home brand milk bottles and it will collect a levy on these products until the end of the year. The funds it raises will be shared via the Dairy Drought Relief Fund, with any Australian dairy farmer affected by drought eligible to apply. Successful applicants can expect to receive funds by January 2019, according to the application form. However, Mr Littleproud said the scheme had become a "farce" because Coles-supplying farmers could not be assured of a payment. "I was initially prepared to give the benefit of the doubt but it hasn't been followed up with good policy work - it's an empty media stunt. The result is a half-baked policy which only applies to Coles' three-litre variety of their own milk brand," he said. Mr Littleproud encouraged shoppers to buy branded milk to support farmers, instead of buying supermarket home brand products. He doubled down on his assault this morning, saying Coles is "either lazy or at best being slippery" by adding a layer of "bureaucracy" to the process in making farmers apply for the funding. "They've asked the farmer to apply for it," he told ABC. "What Woolworths did, was they've handed it back to the process sorts, because they pick up the milk, they know where it comes from. This shows that Coles are either lazy or at best being slippery." However, Coles has hit back at the criticism. 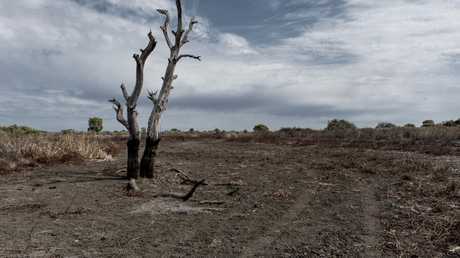 "It is disappointing that the Minister has chosen to criticise Coles - which has already committed over $12 million for drought relief - before becoming familiar with the facts," a spokesman said. "Coles established the Dairy Drought Relief Fund to ensure 100 per cent of the funds raised from this 30c increase on the price of Coles own brand 3 litre milk will be donated directly to dairy farmers affected by drought." The company appointed PwC as an independent auditor to oversee the application administration process and verify funds have been allocated to the farmers as promised, the spokesman said. The agriculture minister also took Woolworths and Aldi to task. Woolworths has only been applying the levy to their own $1 milk and Aldi has refused to look at a levy at all, he said. "The big German can go and take a running jump if they can't be bothered to support Australian dairy farmers," Mr Littleproud said. In September, dairy farmers called for a 10-cent-a-litre levy on all milk sales to help farmers battling drought. Coles and Woolworths initially announced a temporary levy on their 3 litre generic milk, raising the price from $3 to $3.30, with the extra money given to drought-stricken producers. Woolworths' levy was to apply until mid-October, when it introduced a special drought relief range of milk at $1.10 per litre in Queensland, NSW, ACT and Victoria, with funds going to farmers in those states. The supermarket says it has already raised around $500,000 for drought-stricken dairy farmers. Woolworths Director of Fresh Food Paul Harker said; "It's been pleasing to see customers get behind this effort in support of Australian dairy farmers doing it tough in the drought. "With the introduction of a two litre variety and our drought relief labelling, we're making it easier for more of our customers to support the effort if they have the means to do so. "We've sent our first drought relief payment to Parmalat and will be working closely with them to ensure relief starts to flow through to drought-stricken dairy farmers as quickly as possible." Parmalat will begin distributing the monthly payments to more than 280 dairy farmers across New South Wales, Queensland and Northern Victoria from today. Funds will be distributed to dairy farmers each month based on the volume of milk they provide to Parmalat, with a minimum safety net of $1,000 per month for smaller farmers. News.com.au has approached Aldi for comment.